Q: I am looking for a circulation pump. Style RFPN Type MO(S) Mod. P300A, do you have one, or know of someone that does? A: The P300A refers only to the UL model number for the motor. It does not refer to the actual item you may own. The P300A was made in two basic versions. The RF300S is the most common version and has been replaced by the RO320S which is listed on this site. The other main version was the RO300S-IL which was used by a few companies in fountain applications that have tube connected to both the inlet and outlet. Sometimes these pumps were submersed in the water and sometimes dry mounted under the basin. Due to the very small sales on this item it was discontinued and not replaced by the manufacturer. Some parts such covers, rotor/impellers and flow controls are still available and can be purchased on this site. Q: Would this be a good replacement for a Rena flow 400 submersible pump? A: The RO600S is too large for that application. The RO320S with the 3/8" adapter is the one I recommend. A: The best replacement for the RF400S is the RO320S or RO400S. The 320S will fit any tight space and has a 3/8" adapter which is the common tubing used on most RF400S. 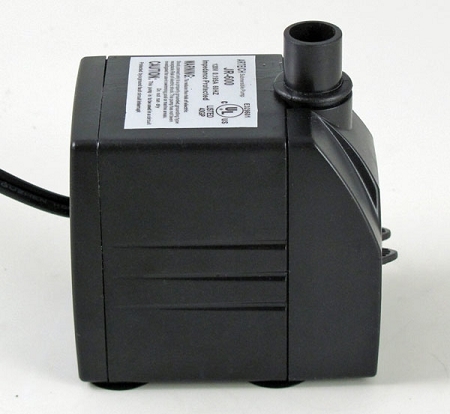 Q: Can I use this pump in a outdoor fountain? 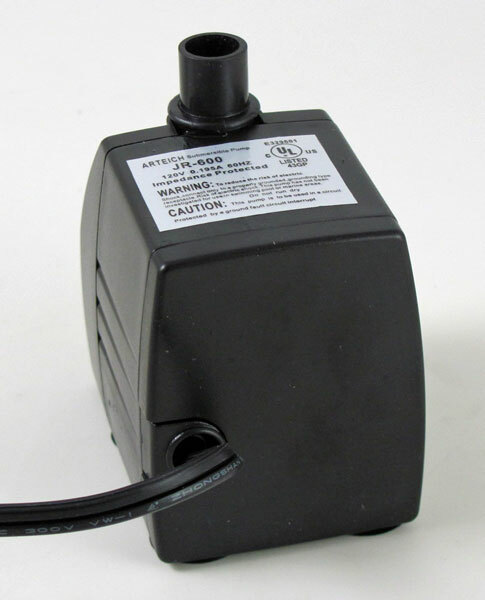 A: Legally in most counties in the US you can use a two-wire cord pump on a fountain but there are some disadvantages. 1: The cord can wear out faster if exposed to the elements and may cause an electrical hazard. 2: Some insurance companies will not cover losses if any electrical item is not properly installed (ie: wrong cord) and then causes damage in some fashion. 3: Manufacturer's warranty not valid if pump used in unapproved fashion. Having said all that I have sold those type pumps for outdoor use, especially when used in a covered area like a patio with no problem for over 20 years but you do need to check and make sure this doesn't cause you any problem in local area. Also, the cord is what wears out and you don't have the extra layers of protection afforded in a three-wire shielded cord. That is why it is so important to protect it from the elements and make sure you at least plug the pump into GFCI protected extension cord or outlet. Q: Does this pump have an inlet tube for the water to flow in and does it have an outlet tube for the water to be pumped out? I only see one tube. I need a pump that is not submerged. A: It does not have inlet tube, just outlet. We no longer sell any pump that small with inlet and outlet tube. Your best bet might be an aquarium powerhead. Most of these have inlets and outlets. The only problem is the volume as many are more than 200gph. A: There are two items that are similar. The RO600C and RO600S. 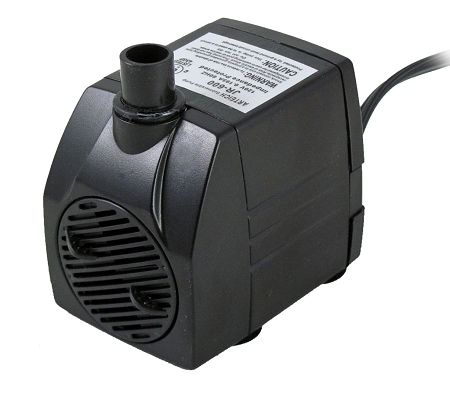 The pumps are the same but the 600C has a two-wire grounded cord and is not recommended for outside use. The RO600S has a grounded cord and is recommended for outside use and is UL approved. Having said that I think you might have the RO600C with a non-grounded cord. Sometimes these were used in aquariums and have a small tube on the front which sometimes had a filter. Also, sometimes these were mounted underneath and the water just flowed them while not submersed. If you have this type pump we have no substitutes. Depending on what is wrong with pump we might have parts to fix it.